Many people experience heel pain at some point in their lives. Heel pain is usually caused by repetitive stress on the feet, rather than a single event or injury. There are several different conditions that can cause heel pain. Here are explanations of some of the most common causes of heel pain. The plantar fascia is a ligament that runs the length of the foot, connecting the heel to the toes. Sometimes, the plantar fascia gets stretched too tight. This can be caused by the shape of the foot, like high arches or flat feet, or by repetitive motion, like long-distance running. When the plantar fascia gets stretched too far, it can develop tiny tears and become inflamed. 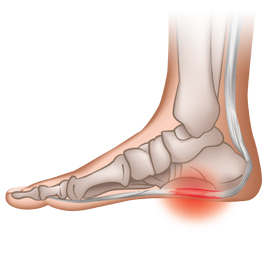 This inflammation causes pain that is often located in the heel area, although the pain can also be located in the arch of the foot. The pain resulting from plantar fasciitis is often most noticeable when a person first stands after a long period of rest, such as when they first get out of bed in the morning. The first line of defense for treating plantar fasciitis is rest. Limit those activities that provoke your pain. Elevate the feet, apply ice, and take over-the-counter anti-inflammatory medication. Going forward, you can provide support to your feet and prevent pain by wearing well-fitting shoes with orthotic inserts. The heel contains a bursa, which is a sac of fluid that is located on areas of the body where tissues, bones, ligaments, and tendons may rub against each other. The bursa is there to protect these various components and provide a cushion. At times, the bursa can become inflamed. This condition is called bursitis. Bursitis can develop as a result of trauma, repetitive motion to the area, or conditions like arthritis. If you have heel bursitis, you may notice pain, swelling, and redness in the area of the heel. Treatment for heel bursitis includes rest, elevation, and ice. If the area is warm or red or you have a fever, you should see a doctor. The bursa may be infected, which could require treatment with antibiotics. Heel bumps are a condition that is common among teenagers. This is also known as Haglund’s Syndrome. In young people, the heel bone is not fully developed. It may rub excessively, which results in the formation of excess bone material. This can be caused by the shape of the foot, particularly flat feet or high arches, or by wearing high heeled shoes before the feet are fully developed. Treatment for heel bumps includes rest, ice, elevation, and anti-inflammatory medications. It is also important to care for feet with heel bumps by wearing comfortable shoes. If you have heel bumps, you may find that backless shoes are the most comfortable for you. At times, the nerves in the ankle and back of the foot can become compressed or pinched. This can cause a burning pain through the heel and ankle. It can be caused by improper pronation, an injury to the ankle, or inflammation of the tendon. If you have tarsal tunnel syndrome, you should rest the foot, apply ice, and take anti-inflammatory medication. In addition, supportive shoes and custom orthotics can be a great aid in relieving pain and preventing future complications. If you are suffering from heel pain caused by any of these conditions or others not discussed here, contact Foot Solutions or visit our store in your area. We can assess your feet and provide you with custom arch supports and supportive shoes that will help to relieve your heel pain. We can also modify our shoes to help relieve any specific painful areas.